"Dandelions are a healthy, wonderful way to ring in the spring. You can find dandelion greens in the store but fresh picked are the best. Make sure to get them early in the spring for the most tender greens! Yes, the little flower buds are edible." Bring a large pot of salted water to a boil. Add potatoes and cook until tender but still firm, about 15 minutes. Drain, toss with butter, and season with salt and pepper. Place bacon in a large, deep skillet. Cook over medium high heat until evenly brown. Remove the bacon and drain on paper towels. Set aside the pan with the bacon grease. 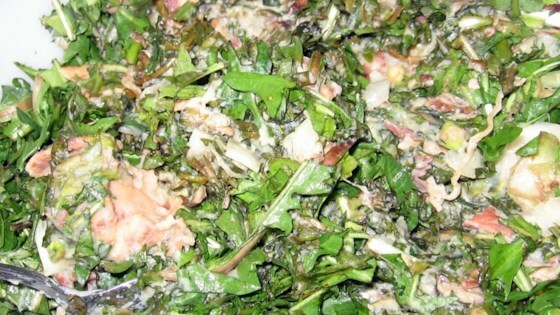 In a large bowl gently toss together the dandelion greens and onion. In a small bowl, whisk together the egg, vinegar, and sugar. Season with salt and pepper. Stir the egg mixture into the skillet with the warm bacon grease. Mix in the diced bacon and flour, and whisk for about 1 minute, until thickened to the consistency of salad dressing. Pour at once over the dandelions and toss to coat. Serve the greens over the potatoes. Great recipe. My mother made this every spring!